Scouring the world for the most dynamic watch and jewellery collections, our team puts a lot of energy into discovering new brands, which are creating a buzz around the world, for our customers. Even then, achieving a general consensus, and getting them to agree on a collection which meets with our own demanding criteria is no easy task! One of the most interesting brands to have caught our attention in recent times is the young French brand, Briston. Using novel materials across a range of styles, the Briston collection really does stand out from the crowd. 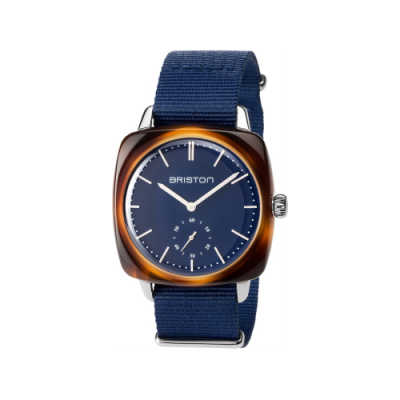 Thanks to their distinctive ‘cushion’ shape case designs, the use of coloured acetates, their particular attention to detail, and with interchangeable NATO, leather, fabric or rubber straps, the ease with which it is possible to quickly transform the entire character of each watch, Briston have arrived with something quite different. How did Weir & Sons Choose Briston Watches? 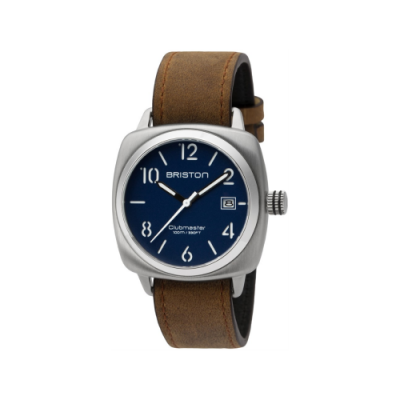 So what exactly is it about Briston watches that could bring our buyers together in agreement, about this relatively new brand? Well, perhaps it’s because we think it’s a really cool little brand. Based in the centre of Paris, the fashion capital of the world, its designer and brand owner Brice Jaunet has made certain to capture and infuse that unique sense of Parisian chic, with an enduring sporty style. They have managed to create a range of watches which appeal to those with an eye for something different. And we think it shows in the watches. With design inherent in the family heritage (his grandfather a founder of popular French fashion brand NewMan in the 1960s), and drawing from his own early career in the luxury maisons of Cartier, Zenith and Raymond Weil to name a few, it’s clear that in every aspect that the Briston collections have been thoughtfully designed and beautifully finished. Jaunet uses imaginative materials, such as the striking cellulose acetates which define many of the Briston models on display in the Weir & Sons Fashion Room. 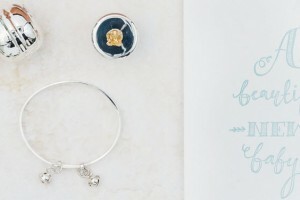 Essentially, the Briston brand is comprised of five collections. These incorporate the 40mm Clubmaster Classic and Clubmaster Vintage models, the 42mm Clubmaster Sport and the new for 2017 Clubmaster Diver Automatic, as well as the ladies Clubmaster Chic. Thanks to the distinctive curvaceous flowing contours which define the brand’s identity, combined with colourful dials and a huge range of straps, none of these are really gender specific (apart from perhaps the Chic model). Sitting on, rather than hugging the wrist, they are really comfortable to wear. Therefore, we think that if you like it, then it’s right for you! There are a multitude of little design details which distinguish Briston in their class, and one of the first things you’ll notice about them is the pebble-smooth, ‘cushion’ shape of the Briston case. It’s square-ish, but with no angles or sharp points. It has rounded corners and a really sleek curved profile. Then there’s the unusual, but remarkably appealing cellulose acetate case material, which is used on many of their watches. If you think of classic Wayfarer sunglasses, with that golden-brown ‘tortoise shell’ frame, then you already know what we mean. The irregular patterning of the acetate is the result of actual cotton flowers being added to the molten cellulose. 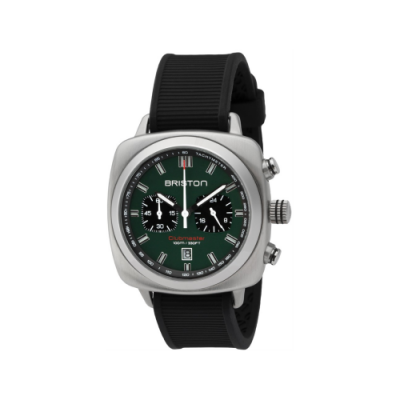 There’s nothing else really quite like them, and when combined with pink gold, polished steel or matt black case detail such as the bezels and crowns, and popped onto a cool NATO or rubber strap, it would not be untrue to say that Briston have created their very own niche in watch design. Of course the tortoise shell acetate look is not for everyone, and so there’s also brushed or polished stainless steel, or gold/matte black/gunmetal pvd versions available across the range. Although the ‘cambered square’ case style is common throughout the Briston range, and all feature a superbly designed quick-change lug, through which your favourite strap du jour can be fed in seconds, instantly transforming the personality of the watch, the collections are basically defined by size and detail. Briston’s Clubmaster Classic collection comes in a 40mm case size, which is perfect for most wrist sizes. It is available as hours, minutes, seconds and date, or as a chronograph (with two pushers either side of the crown on the case side, to time an event or check on elapsed time). The Classic features a ‘sandwich’ dial, usually only found on much more expensive watch brands, so the numerals and hour markers are actually cut out of the upper layer like a stencil, with a contrasting under layer making them stand out. As with all of the Briston collections, the dials vary from monochrome through khakis to colourful, with sunray, gloss or matte finishing. Also measuring in at 40mm the Clubmaster Vintage shares much of the Briston design DNA, yet still has its own very different appearance. There’s no bezel, so the watch seems to be flatter than other models, and the dial fills out more of the watch face. If any Briston could be considered to be a dressier style, then the Vintage would be that model. The dial colours are slightly more reserved with no really bright colours, but once again little details underscore just how much thought has gone into the design of these watches. The dial markers and hands are slender and long, and externally, the old style rounded crown and ‘piston’ chronograph pushers are unique to the Vintage model. The Clubmaster Sport is the 42mm Briston, and in some ways is the Classic’s bigger brother, but as with the Vintage, it has its own distinctive and defining characteristics. The chronograph versions feature ‘panda’-like subdials, which contrast against the principal dial colour, and so are more prominent than on other models. Other Sport features include applied steel hour markers, and the broad steel hands have a generous coating of lume, so low light legibility is pretty good. The non-chronograph HMS model is the only one with day and date functions too. One of two new models to be released in 2017, the Clubmaster Chic is thoroughly feminine with its 36mm case size. While feminine it might be, still with those signature cambered square lines, dainty it is not. With acetate tortoise shell, steel or rose gold versions or combinations of these, the Clubmaster Chic will never be confused with other brands in this crowded sector. The other new for 2017 release is Briston’s Clubmaster Diver Automatic, and marks their first foray into the mechanical wristwatch sector. With a depth rating of 200m it’s a more than capable companion for those who like to escape beneath the waves for their leisure pursuits. It has two crowns, and uses one of those to operate the under-crystal rotating bezel, with 45-minute dive scale, just like the fabulous compressor divers of the 1970s. Equipped with a super reliable Seiko automatic self-winding movement, this stunning watch elevates Briston to a level above the majority of its competition, and also signals where the brand is going. Weir & Sons are always looking ahead in our selection of fine watches and jewellery, we’ve been impressed by this new brand. Of course we can share our thoughts with you here, but there’s nothing quite like a hands-on experience, to fully appreciate up close what’s in store. 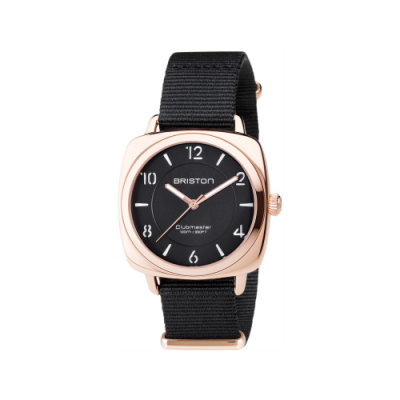 To see our latest addition to the Weir & Sons fashion Room in our Grafton Street store for yourself, make sure you drop in, to be the first of your friends to wear a Briston watch!